What is a Charter Holiday? This truly is the ultimate beach holiday offering unsurpassed quality time with friends, families or just each other. Yachts Gecko and Maki Cat are your floating hotels cruising through the islands of Madagascar’s beautiful Nosy Be: they are your accommodation, restaurant and transport all rolled into one; allowing you to enjoy excursions and activities that you would generally have to pay more for if you were land based. Our charter boats are fully crewed with an experienced skipper, talented chef and cheerful deckhands. Your meals are prepared using the freshest of ingredients, your itinerary planned by the skipper taking into consideration your particular interests. Exclusively yours - the catamaran will take you away from the normal hustle and bustle of the more populated areas to empty beaches, uninhabited islands and unspoilt reefs. Explore rivers, bays and inlets with the on board kayaks or dinghies; visit remote villages; enjoy sundowners with a different sunset each night; rest in peace in the evenings away from others – at anchor in safe moorings; snorkel and fish wherever, whenever and for however long you wish. Specialised dive, fishing or kayaking charters are available at additional cost but for the normal cruising charter these activities are included in the price. A minimum of a six night charter on both boats. A minimum of 4 people for any charter. Charter Yacht Gecko: Since Gecko arrived in Nosy Be as a new charter boat in 2008 she has become, without doubt, the busiest charter boat in the area. Gecko is our favourite "product" in Madagascar and we market her with a passion. We have been privileged to enjoy holidays on board this friendly, comfortable boat and would recommend her for quality family holidays as well as for small groups of friends. Gecko is a 36’ Jaguar catamaran and has four double cabins (2 en-suite) sleeping up to 8 guests. Most ideally suited for small groups of family and friends. Two families with 4 children works very well but more than six adults becomes a bit of a squeeze. Charismatic Albert - the skipper - has been with Gecko from the very start and, with years of experience on the sea, is largely responsible for Gecko's success and popularity with clients returning for more - year after year. 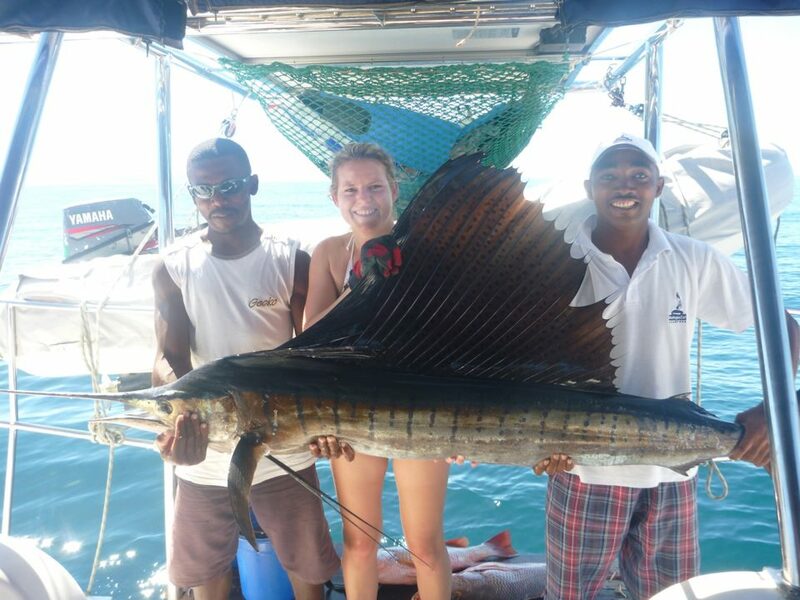 The crew on Gecko have become legendary with Albert, Alex, the ingenious chef and smiling Maurice the deckhand. All have been on board for a long time. You are assured of a very happy holiday - remember whilst a charter may sound expensive this price includes everything except drinks and tips. Endless fishing, endless snorkeling, endless relaxation. Different islands ...reef ... bay ... beach daily. 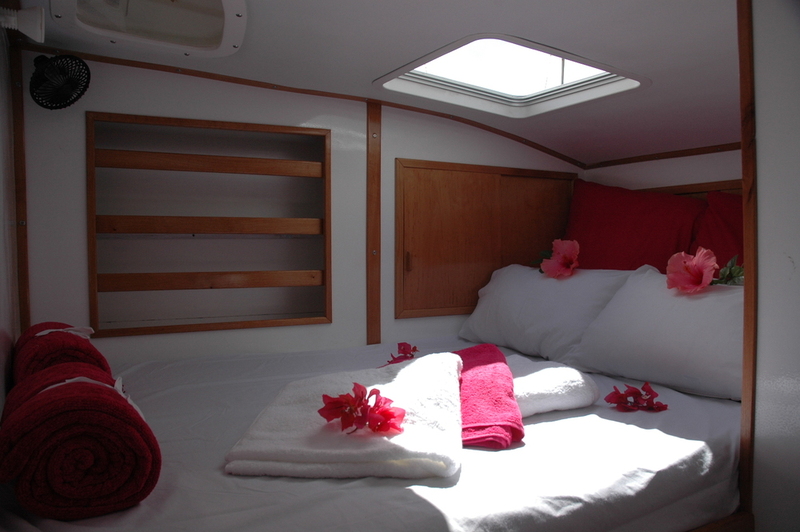 Completely revamped and redecorated in 2014 Maki Cat fills a gap in the charter boat market in Nosy Be. She is a 13.5m motorised catamaran (no sails) and extremely spacious. She has two, double en-suite cabins, two double or twin cabins with a shared ‘bathroom’, a large spacious saloon, lovely flat decks with outside eating areas and a nice big stern deck for kitting up for diving or fishing. 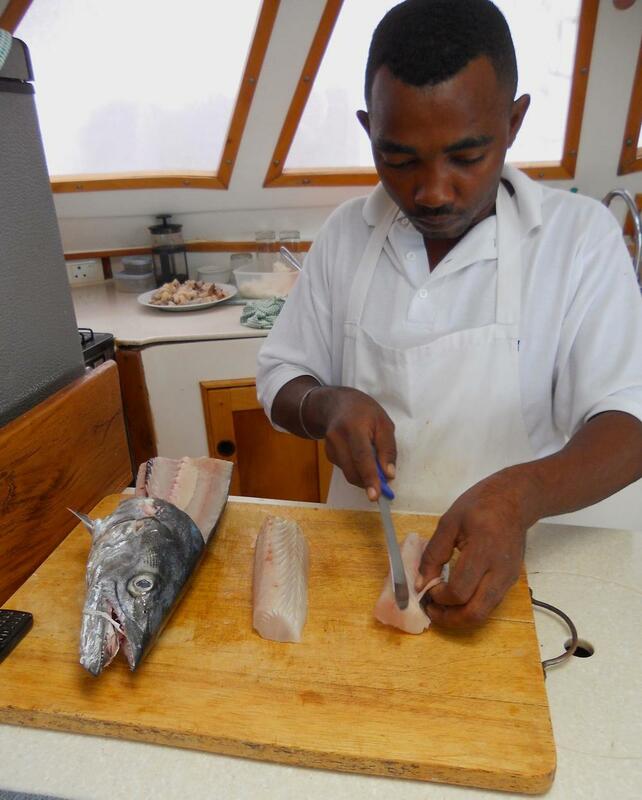 Her crew comprise of Skipper Stephan – a quiet, confident Frenchman married to a Malagasy girl; the great Alex – chef of note who’s fantastic meals are talked about for a long time after the end of a charter and chirpy, ever helpful Noel – the deckhand. Maki is perfect for the slightly larger groups, that don’t mind that she is a motorised boat and not a yacht, and also for diving and fishing groups. Day fishing charters from hotels in the area cost upwards of 600 euro for a day’s fishing; a live-aboard fishing charter allows fishing throughout the day (and night) as you fish from and live on the same boat. Maki Cat has the upper hand over the other charter boats in Nosy Be as she is not a sailing boat and therefore has no rigging to get in the way of casting. She has plenty of flat open deck area, four cabins (sleeping 6 pax without sharing a double bed) and, with her generous saloon/bar area, offers a great base from which to enjoy your favourite past time. Fish include Giant Trevelly (GT or Kingfish), Sailfish, Wahoo, Marlin, Dog tooth and Yellowfin Tuna, King and Queen Mackeral (Kuta) and many reef and bottom fish - truly something to keep the most demanding fishermen happy. By living on board your fishing boat you enjoy the advantage, over the land based charters, of spending more time on the more distant banks and reefs such as Castor and Leven Banks, Cap St Sebastian, Mitsios, Radamas and the mighty Greg's Wall. Yacht Gecko also offers great fishing experiences for the groups and can be used in a double charter with Maki for groups of 10 - 12 people. MadagasCaT offers additional sportsfisher Blue Marlin to accompany either boat giving fishermen a supreme fishing experience. Accompanied daily by either of these superbly kitted boats the clients can live aboard Maki Cat or Gecko at night but fish off a 38' Supercat equipped with live bait tanks, tuna tubes and excellent trawling rods each day. Additional jigging gear among other equipment can be supplied. Fishing grounds that might be tested include Cap St Sebastian, Castor Bank, Mitsio and the Radamas - all at the skipper’s discretion. Blue Marlin costs €800 per day including fuel. Dive Charters: AS FEATURED IN OCTOBER 2014 AND JANUARY 2015 Go! Magazine. And as experienced by Moving Sushi . And, at last, there is a properly equipped liveaboard dive boat capable of reaching the dive sites that the regular dive clubs cannot reach. Maki Cat can sleep up to eight people and comes with her own hugely experienced dive guide, Stephan, to lead the charter and enjoys the support of Sakatia Lodge Dive Centre. To the north of Nosy Be is the Mitsio archipelago with four islands similar to that found in the Galapagos Islands – known locally as the Four Brothers. There are over a dozen different dive sites here, ranging from beginner level to extreme advanced level. In the south are the Radama islands – best for experienced to advanced diving they are famous for beautiful and untouched wall diving, as well as the world renowned "Greg's Wall"; a 10 metre plateau with a vertical drop to 320 metres. For the more experienced divers there is also a cave at "Greg's Wall" with an entrance at 32 metres and exiting at 42 metres with a giant pinnacle on the left as you come out of the cave. The pinnacle is 54 metres straight up to 23 metres. The local waters of Nosy Be offer beginner to experienced divers over 30 dive sites to choose from. Maki CaT offers an exclusive circuit not offered by most other operators, and will include places such as Castor Banks, a near atoll rising from 2300 metres up to 8 metres in the centre. Maki CaT can also get to Nord Cap Sebastian which no other boats do. A package includes return flights ex Johannesburg to Nosy Be, estimated airport taxes, return airport transfers, 6 nights on charter with all meals, activities (fishing, snorkelling, kayaking) and excursions (Tanikely Marine Reserve, Nosy Komba Lemur Park, Antosoa Lemur Island and possibly Lokobe National Park) included. The 7th night (#1 or 7) will be added to this package at a hotel on Nosy Be; the choice of hotel will be discussed with you at the time of enquiry.